A recently launched program aims to provide work for about 12,500 Ethiopians in beekeeping and silkworm farming. It’s supporting out-of-school and unemployed young people between ages 18 and 24. Nairobi, Kenya — Beekeeper Ayenalem Ketema is the proud owner of three hives which have produced enough honey for the young Ethiopian to build a house equipped with solar panels and buy some farm animals with the proceeds. Ketema, who lives in Jimma in southwestern Ethiopia, left school when she was 17 and has kept bees for four years. “I have benefited a lot from using a modern beehive,” said the young farmer, now 22. She belongs to the Boter Boro Cooperative, whose members run 50 beehives between them. With the profit from the 60 kg (132 lb) of honey she harvests each season, Ketema has purchased a dairy cow, three sheep and six goats, and installed a solar system in her home. Now she has bigger ambitions. “I plan to open up a wholesale honey shop where I can sell high-quality honey in large quantities in a bigger market,” she said. Ketema benefited from a project led by the International Centre of Insect Physiology and Ecology (ICIPE), which launched a fresh program last month to provide work for around 12,500 young Ethiopians in beekeeping and silkworm farming. Nairobi-based ICIPE and the MasterCard Foundation plan to invest $10.35 million in the five-year project, which will support out-of-school and unemployed young people aged between 18 and 24 with starter equipment and training. The Young Entrepreneurs in Silk and Honey initiative will involve an additional 25,000 people in the value chain – from harvesting to processing, packaging and marketing of the two sets of products. Ethiopia is Africa’s leading honey and beeswax producer, but honey production is largely traditional and only reaches around 10 percent of the country’s potential, experts say. The Horn of Africa nation produces dozens of honey varieties that could be of interest for the export market, said ICIPE Director General Segenet Kelemu, an Ethiopian who is a laureate of the L’Oreal-UNESCO “For Women in Science” award. “The project will help to ensure food security, promote more tree-planting than tree-cutting, and encourage agro-forestry programs to flourish,” said Kelemu. Bees pollinate a wide range of crops and plants, playing a key role in the provision of food and nutrition. They also pollinate forage plants, indirectly supporting milk and meat production. “Without bees and other related insect pollinators, our lives would be negatively impacted. This work will be generating great incentives to take care of bees and their well-being,” Kelemu said. With the amount of annual global food production dependent on pollinators estimated at between $235 billion and $577 billion, bees must be included in plans to feed the world’s growing population, she added. 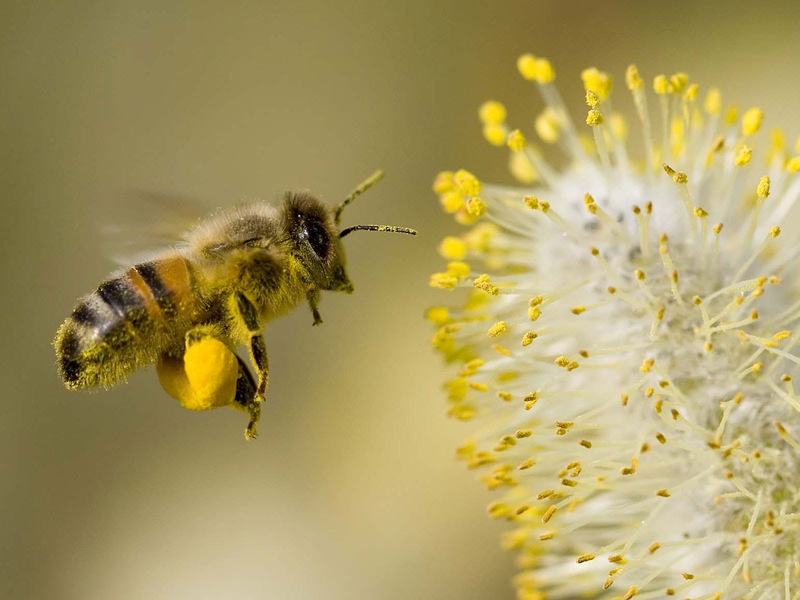 Bees require flowering trees and vegetation from which they can secure high-quality pollen and nectar all year round. This means the young Ethiopian beekeepers will have to conserve trees and plant more of them, while reducing the use of pesticides that harm bees, Kelemu said. Alemayehu Konde Koira, senior manager of the youth livelihoods program at the MasterCard Foundation in Toronto, said the modern hives that will be used in the Ethiopia project can produce 20 kg (44 lbs) of high-quality organic honey each season, compared with traditional beehives which yield 6 to 8 kg of low-quality honey. The modern hives are more productive because they are a good size and well-ventilated, compared with the cramped hives many use, which are made of reeds and cow dung and hung up in trees. “Technologically superior hives could transform the honey industry in Ethiopia,” Koira said. The project is also fostering silk production because demand for raw silk has increased around the world, he added. Ethiopia anticipates that demand for its silk yarn will grow 5 percent per year. ICIPE provides technical training and know-how in silkworm rearing, cocoon production and silk post-harvest techniques, and also supplies silkworm eggs. The MasterCard Foundation said the project would improve access to regional, national and international markets for young entrepreneurs. They will also be offered financial services so they can grow their businesses. “When traveling through Ethiopia, the countryside is dotted with farmers trying to sell their honey by the roadside or in villages for brewing a local beer called tej. What’s urgently needed is an expansion of market opportunities for honey and silk farmers,” said Koira. Centers will be set up to provide training and ensure young entrepreneurs can not only process their honey, beeswax, royal jelly and bee venom, but also tap into new markets. The project will apply lessons from earlier projects supported by the Swiss Biovision Foundation for Ecological Development and the International Fund for Agricultural Development in Ethiopia, Kenya and elsewhere in Africa. One key discovery has been the transformative power of new technologies. In the past, few women became beekeepers because traditional hives are usually placed high up in trees. But modern hives set on the ground make it far easier for them. Forty percent of the new project’s participants will be young women. ICIPE’s Kelemu said both beekeeping and silk farming require only small amounts of capital and land – most of which is owned by men in Ethiopia. The project will also attempt to break down barriers to women’s participation in the two industries. “Provided with the right tools, such as a modern beehive, young women can benefit from activities traditionally considered a man’s domain,” said Koira. • Editing by Megan Rowling. This story originally appeared on the website of the Thomson Reuters Foundation, the charitable arm of Thomson Reuters that covers humanitarian news, women’s rights, trafficking, corruption, and climate change. Visit www.news.trust.org.